Hands of Deinonychus (left) and Archaeopteryx (right). John Conway (Wikipedia). When Darwin published On the Origin of Species in 1859, it was generally thought that birds, the entire class, came into existence some time during the Eocene Period. This was the time that the first modern mammals also arose, long after the extinction of dinosaurs. A year later a fossilized feather was discovered in the deposits of the German limestone quarry Solnhofen in Bavaria between Nuremberg and Munich. The limestone there was of such an exceedingly fine quality that it was mined to form the plates for lithographic printing. The carbonates of the muds “form a type of fine-grained, flat-cleaving limestone (known as Plattenkalk in German)” that, according to the University of California’s Museum of Paleontology, was quarried as far back as the Stone Age for roof and floor tiles. Because of the texture of the rock, they form especially detailed fossils. The feather discovered in 1860 was an example, but fossils of all sorts of creatures, some preserving soft body parts, had long been known to occur there. Significantly, the deposit was known to be far older than the Eocene Period. In 1861 a more spectacular find was unearthed in this deposit—a nearly complete fossil of what appeared to be a prehistoric bird. Now known as the “London Archaeopteryx” (because it was sold to the London Museum of Natural History soon after its discovery), it was an exquisitely preserved specimen (although missing its head and neck) and undeniably possessed feathers—the defining feature of modern birds. Its fingers were modified in a way much like the wings of modern birds. But it had a long tail. This was clearly a “missing link” (in the inaccurate popular parlance), and Darwinists triumphed in the discovery. 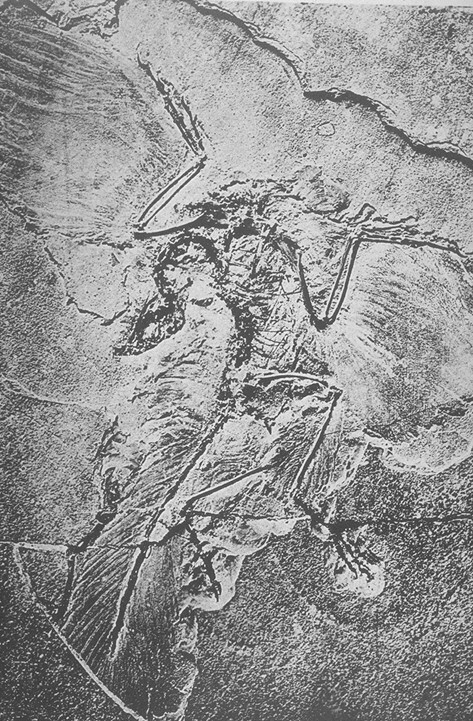 The London Archaeopteryx from Owen’s 1863 paper. Click to enlarge. The animal was formally described by Richard Owen, arguably the most talented comparative anatomist of the day and no Darwinist. In “On the Archaeopteryx of Von Meyer, with a Description of the Fossil Remains of a Long-Tailed Species, from the Lithographic Stone of Solenhofen,” 153 Phil. Trans. R. Soc. Lond. 33-47 (January 1, 1863), he concluded that the animal was a bird, despite many features clearly reptilian and named it Archeopteryx macrurus. (Von Meyer, who discovered it, used lithographica as the species name, which is how it is called today.) Darwin considered Owen’s analysis so important that he added the discovery and Owen’s conclusion to the 4th edition of On the Origin of Species in 1866. In a series of papers between 1868 and 1870 Thomas Huxley, Darwin’s most zealous advocate, took up the case as a specific example of descent with modification (as evolution was then called). He argued that Archaeopteryx had similar skeletal anatomy to two dinosaurs—Hysilphodon and Compsognathus. * The conclusion to be drawn was that Archaeopteryx—and all birds—arose from dinosaurs. Owen, who had coined the term Dinosauria, rejected the idea. The dispute lined up partisans on both sides and then eventually died out. One either saw the resemblance or not—there were not enough dinosaur specimens (and no field of cladistics) to do much more at the time. The Berlin Archaeopteryx in a photo from 1880. Possibly the most famous fossil ever discovered. Click to enlarge. In 1876 another Archaeopteryx was discovered in Solnhofen. This one was even more spectacular than the London specimen and, importantly, preserved the skull. It revealed that the animal had teeth like a reptile! This (in addition to the wing claws and the long tail) showed that it was not a modern bird. (By tail, I don’t mean a tail feather. Archaeopteryx had a full set of caudal vertebrae; the “tail” of modern birds end in a fused pygostyle—check your next Thanksgiving turkey.) Aside from all other considerations the Berlin Archaeopteryx is a stunning piece of visual “art.” Its death pose—with its wings splayed and its head bent back—draws the viewer in the same way a painted crucifix does. The position probably owes to the manner of its death. Suffocating animals often assume a position like this in attempts to breath. The Solnhofen during the Jurassic Period was a lagoon. The animal probably drowned and was covered with layers of fine mud. The explanation, however, does not detract from the iconic beauty of the image. Over time, 10 specimens of Archaeopteryx have been recovered from the Solnhofen. The deposit has been dated to the Late Jurassic Epoch approximately 150 million years ago. This means that birds lived for at least 85 million years while dinosaurs were still alive. (It also means that we are closer in time to Tyrannosaurus rex than Tyrannosaurus rex was to the Archaeopteryx.) The dating of the fossil becomes important later in this story. The debate over the dinosaur origin of birds died out not long after it began. During the next hundred years thousands of dinosaur fossils were recovered. Most of the discoveries took place in the American West, where several geological formations, particularly the Morrison Formation, yield up spectacular and numerous specimens. The Morrison Formation, centered in Wyoming and Colorado (with outcroppings in surrounding states), was Late Jurassic rock, which produced such specimens as ankylosaurs, stegosaurs, the most famous sauropods like Diplodocus, Apatosaurus, Brachiosaurus, and theropods (the meat eaters) like Allosaurus, Ceratosaurus and Ornitholestes. Other rock formations of the upper midwest include the Early Cretaceous Cloverly Formation in Montana and Wyoming and the Late Cretaceous Hell Creek and Judith River Formations in Montana. All of these fossil sites became the battleground of a competition to acquire the most, the biggest, the strangest and the most complete Mesozoic skeletons. The institutional players were the Yale Peabody Museum, the Carnegie Museum in Pittsburgh and eventually the American Museum of Natural History. Only a part of the mineralized bone shipped back east was mounted for exhibit. A large portion remained crated in the basements of the institutions. In 1964 Ostrom led a group from the Peabody Museum to the Cloverly Formation where over the course of three seasons they amassed hundreds of bones. These bones together with the material at the American Museum of Natural History eventually led to the publication in 1969 of one of the most consequential papers in dinosaur paleontology: John H. Ostrom, “Osteology of Deinonychus antirrhopus, an unusual theropod from the Lower Cretaceous of Montana,” 30 Peabody Museum of Natural History Bulletin 1–165 (1969) (which you can read online here or download the complete monograph in pdf format here). The frontispiece illustration captured the striking features that Ostrom contended the animal exhibited. The horizontal posture of the dorsal vertebrae (the vertebrae of the back, below the neck and above those which fused with the pelvis) were suggested by the scars on their neural spines resembling those on the vertebrae of large flightless birds: the ostrich, emu and cassowary as well as the extinct moa. The scars were anchor points for ligaments between the spines, necessary for the horizontal posture. The cervical vertebrae showed a curve of the neck upward as in those ratite birds. This forward lurching position was entirely at odds with the view of theropods, like Tyrannosaurus rex, lumbering in a fully erect posture. 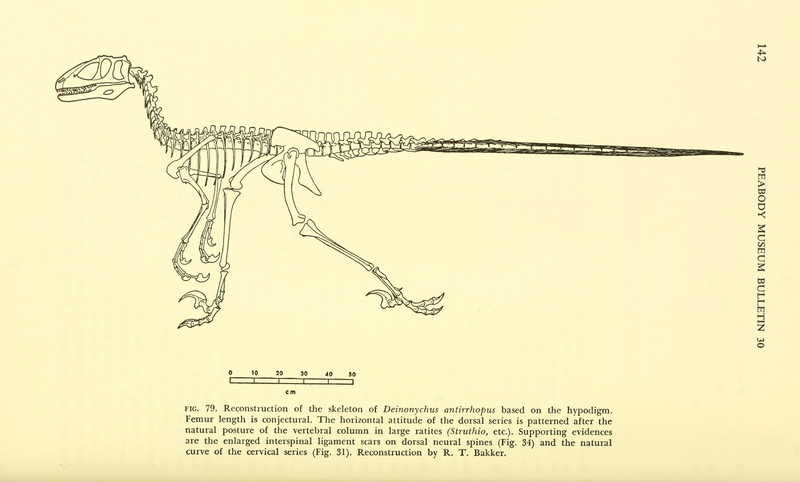 Reconstructed Deinonychus skeleton from Ostrom’s 1969 mongraph (drawing by Robert Bakker). Click to enlarge. 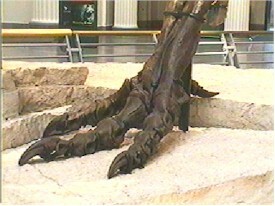 Foot of “Sue” in Fields Museum of Natural History in Chicago. Three toes forward; one (hallux) behind. Birds have wishbones (furcula)—collar bones fused at the sternum. The furcula strengthens a bird’s skeleton to withstand the force of wing movements. It stores and releases energy during flapping. But the bone is also found on T. rex among other theropods. The furcula in the T. rex probably stabilized the skeleton while it was ripping flesh by shaking its head back and forth. 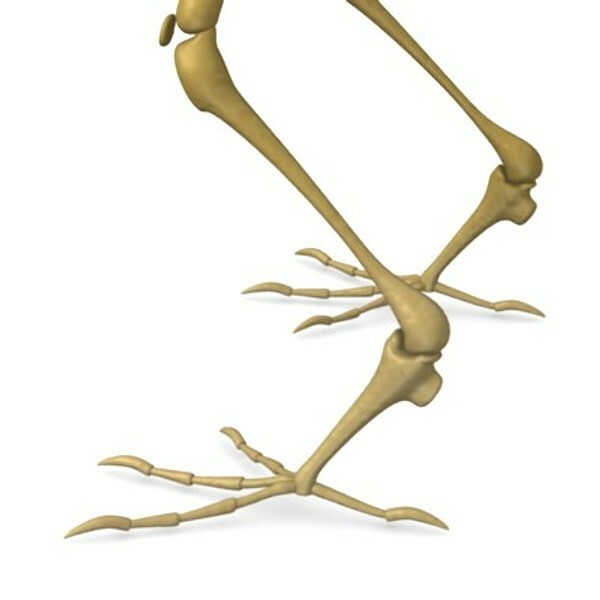 Most birds have three toes with an additional reversed one (the hallux). So does T. rex.† More generally, they both show digitigrade posture—their weight is placed on toes directly beneath the body. Both birds and T. rex have very large orbital openings (orbits or eye holes in the skull). The eyes of birds are so large relative to the skull that in many cases they are press closely together and nearly touch in the back—they are separated only by a thin bone. This results in the need to squeeze the brain to the back of the skull and restricts the connection between the olfactory organ and the brain to a small space.‡ Birds are thus more visually oriented than oriented by the sense of smell (like many mammals). 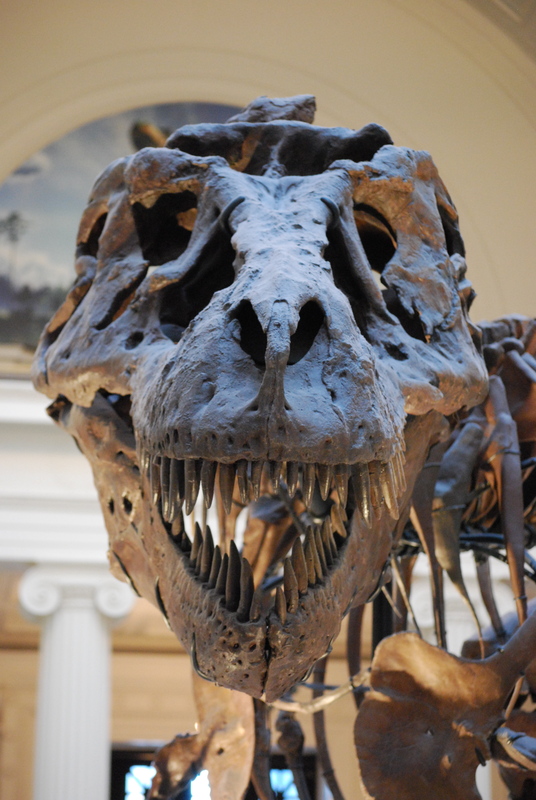 The eyes of T. rex are situated so that they point forward in a way that gave it binocular vision (where the field of vision in each eye overlaps part of the field of the other). This enables the animal to see in three dimensions. Almost all birds likewise have binocular vision. For pursuing predators and animals that move in three dimensions (such as flying birds or gibbons swinging from branch to branch) , the ability to judge depth and see in sterescope is invaluable. Replica of “Sue’s” skull on display at Field Museum of Natural History in Chicago (Wikipedia). Click to enlarge. There are other skeletal similarities, but at this point let’s note that T. rex came 83 million years after Archaeopteryx and therefore likely acquired adaptations unknown to the ancestor of birds (or any of its descendants). Nevertheless, the body plan of this giant theropod is remarkably similar (overall and in important details) to modern birds. There are extinct theropods much more closely related to modern birds than T. rex. The group Maniraptora includes the dinosaurs most closely related to birds. ** Deinonychus is a maniraptor as are Velociraptors, troodontids like Anchiornis, alvarezsaurs like Mononykus, oviraptorsaurs like Kol and Oviraptor and therizinosaurs. 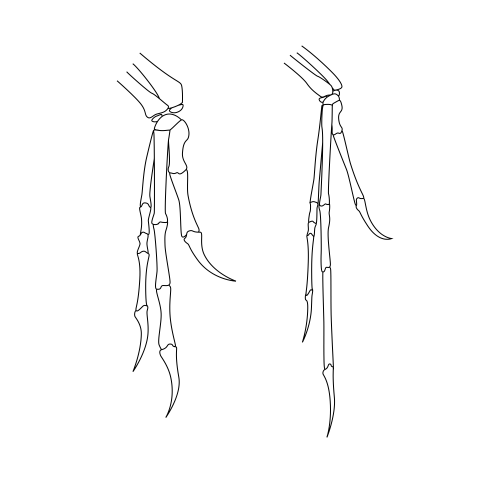 These animals have a unique bone in the wrist—the semilunate carpal—which permits the sideways folding of the forearm, a bone also present in birds. In fact, it is the key modification of the wrist allowing for a wing. All maniraptors have breast bones; they are the only dinosaurs to have them. The breast bone is used by birds to anchor the massive muscles needed to power flight. There are other technical similarities among extinct maniraptors and birds seen nowhere else. 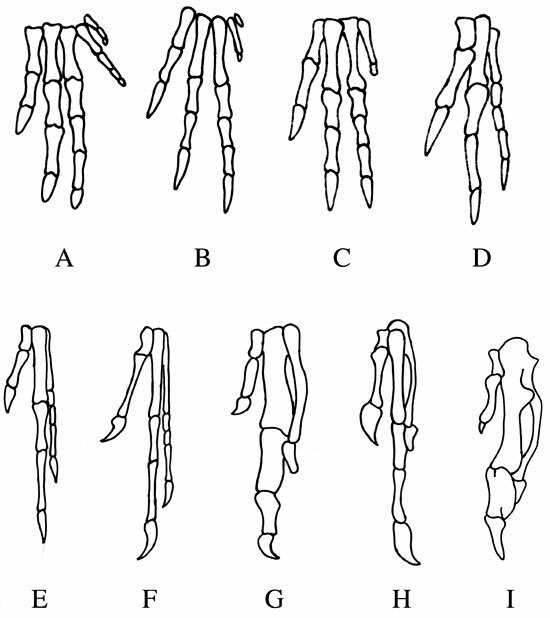 Phylogenetic-historical evidence unambiguously indicates that birds lost digits 4 and 5, retaining digits 1, 2 and 3. Succesive taxa share a more recent common ancestor with modern birds (Neornithes). (A-C) Triassic dinosaurs: (A) the ornithischian Heterodontosaurus, (B) the early theropod Herrerasaurus, (C) the neotheropod Coelophysis. (D-E) Jurassic theropods: (D) the tetanuran Allosaurus, (E) the early maniraptoran Ornitholestes. (F-G) Mesosozoic birds: (F) the Jurassic avialae Archaeopteryx, (G) the Cretaceous enantiornithe Sinornis. (H-I) Modern birds: (H) the wing of an Opisthocomus (hoatzin) hatchling, (I) the wing of the adult chicken Gallus. Modified from Vargas & Fallon (2005). From A.O. Vargas, “Beyond Selection,” 78 Revista Chilena de Historia Natural 739-752 (2005). Modern phylogenetic analysis is more sophisticated than this. It tries to place organisms into increasingly smaller groups with a presumed common ancestor. All descendants from each group (called a “clade”) are members of the clade (by definition). Evolution is presumed to occur by binary branching. To sort out the groups of ancient animals based on fossils, numerous physical characteristics (+ / -) are designated for all the organisms and the set of characters for each are fed into a program which shows possible relationships. There are basic rules for presuming descent based on theories of inference. One is that the more simple (or parsimonious) relationship is preferred over the more complicated. It is more simple to assume that a characteristic arises once and all organisms possessing that characteristic are related by common descent. The more characteristics a group shares (not shared by others), the stronger the presumed relationship. A simple example: while it’s conceivable that hair could arise separately by animals who have no immediate common ancestors, it is hard to conceive that animals with hair, placentas and mammary glands arose separately. With the discovery of numerous theropods around the world during the twentieth century, it became clear from this type of phylogenetic analysis that birds belonged in the group Theropoda, and more specifically, Maniraptora. Yale’s Jacques Gauthier performed the first definitive cladistic analysis of the relationship between birds and theropods and came to the conclusion that modern birds are firmly “nested” (cladism-speak for “securely a member of”) within Maniraptora. See Jacques Gauthier, “Saurischian monophyly and the origin of birds” in Kevin Padian (ed.). The Origin of Birds and the Evolution of Flight, 8 Memoirs of the California Academy of Sciences 1–55 (1986). Since then controversies have arisen about the precise relationship among maniraptors, but no serious phylogentic analysis has come to a different conclusion about the membership of birds in that group. There have been modern nay-sayers to this conclusion, but not based on phylogenetics. The principal nay-sayer is Alan Feduccia, of the University of North Carolina who was originally agnostic based on the phylogenetic analysis, but became persuaded that flight could not have originated from ground-based theropods. His thinking was that there is no credible mechanism for showing how flight could have arisen in large land animals. The likely way flight developed was from gliding in tree-living animals. Since there were no small theropods showing an arboreal life-style, birds must have arisen from other organisms. The most likely looking organism not a dinosaur was a Euparkeria, a member of the group Archosauria (which branched into dinosaurs and pterosaurs as well as the ancestors to crocodiles). A problem with that theory, however, was that Euparkeria lived during the Early Triassic about 245 million years ago. This means that there is a ghost lineage (a presumed relationship without fossil evidence) for nearly 100 million years between when Euparkeria lived and when Archaeopteryx arose. Nevertheless, Feduccia has become so identified with opposition to dinosaur origin of birds that he once said: “In my opinion, the theropod origin of birds will be the greatest embarrassment of paleontology in the 20th century.” Feduccia thus became a widely quoted scientist in creationist circles. Other skepitcs include John Rubin at Oregon State University and Larry Martin of University of Kansas, Lawrence. Although both of these claim to be evolutionists, they argue much like creationists. Although they produce peer-reviewed papers, the comments they make outside them, including in press releases announcing the papers, go well beyond what the papers show. Moreover, their attacks are rearguard and when an argument is defeated they take up another. Since the time of Ostrom’s Deinonychus paper the principal arguements against the dinosaur origin of birds have been: 1) Where did feathers come from ? ; 2) How did avian respiration arise? 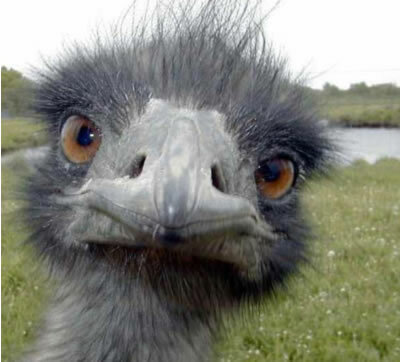 ; 3) Why are all the extinct non-avian theropods later than the first birds? Answers to these questions came with discoveries in the last twenty years. The most stunning was the discovery of feathered dinosaurs. The first feathered dinosaur and most of the later ones were found in the Early Cretaceous Yixian Formation in northern China. Under Mao the paleontology of northern China was a closely guarded secret. In the mid 1990s, however, word leaked out that feathered theropods were discovered. Ostrom called the discovery “the biggest event in evolutionary science since Darwin put forth his theory.” After the first pictures leaked out the discoveries seemed to flow like a fountain. The Sinosauropteryx had a coating of primitive filaments. Phylogenetic analysis showed it to be a close relative of Huxley’s Compsognathus. The Caudipteryx, described in 1998, looked very much like a bird and had symmetrical pennaceous feathers in a wing-like array on its second digit. Such feathers are the kind modern birds develop. Over twenty different theropods with feathers have been discovered. Some of the feathers are preserved in such detail that the melanosomes, the pigment organelles that give feathers their color, were preserved allowing the reconstruction of the color of the animal. Anchiornis was the first non-avian theropod fully plumed by scientists—using a technique first conceived by Nick Longrich of Yale. The problem of avian respiration was solved by a closer analysis of anatomy. 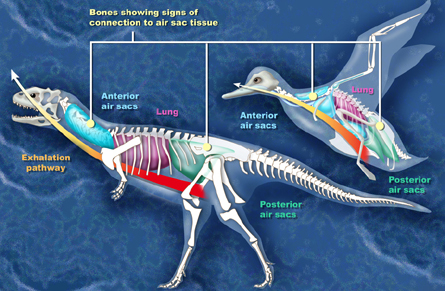 The one-way breathing system of birds depends on the availability of air sacs tucked into hollowed-out parts of bone. Examining analogous bones in theropods shows similar hollowing. It seems probable that theropods and possibly other dinosaurs used the same breathing arrangement. The advantage (over the diaphragm-operated lungs of mammals) is that the oxygen accepting blood of birds is constantly bathed in the highest concentration of oxygen available. This is undoubtedly useful for large predators which have immense needs for oxygen while running. It is possible that the system arose from necessity. There were times during the Mesozoic Era that oxygen concentrations in the atmosphere was less than half of that of today. A unidirecitonal respirational system in such an environment would allow greater metabolic activity and increased survival opportunities as a result. Indeed it is likely that such a system of respiration appeared at the very beginning of the Age of Dinosaurs. This conclusion stems from the fact that alligators possess a similar respiration system. See C.G. Farmer & Kent Sanders, “Unidirectional Airflow in the Lungs of Alligators,” 327 Science 338-340 (January 15, 2010) (full access with free registration). Crocodilians, dinosaurs and birds are all archosaurs. But the crocodilians and dinosaurs (and birds with them) split apart about 246 million years ago. Because it is unlikely that birds and alligators independently evolved the same respiration system, the natural conclusions is that all archosaurs had such a system before the lines split and that the dinosaur descendants of those archosaurs retained the system (and passed it on to birds). The issue that has been dubbed the temporal paradox arises because the theropods most closely related to Mesozoic birds were found in the Cretaceous (the Yixian formation was a Cretaceous formation) while Archaeopteryx was found in a Jurassic deposit. Of course no one contended that birds descended from later theropods; rather, the later theropods and birds shared a common ancestor. The “paradox” is largely the problem of incomplete fossil records. But even so, recent discoveries have greatly reduced the force of the argument. First in 1999 a feathered dinosaur, Sinornithosaurus, was discoverdd in China and formally described. The animal was a dromaeosaur—the same group that Deinonychus and Velociraptor belonged to. It was discovered in the Yixian Formation so it was Early Cretaceous. But phylogenetic analysis showed that it was more primitive than Deinonychus and other advanced dromaeosaurs. And certain features of the skull and shoulder were much more like Archaeopteryx than more advanced dromaeosaurs. This suggested that more primitive (and presumably earlier) bird-like maniraptors were more closely related to birds than later ones. 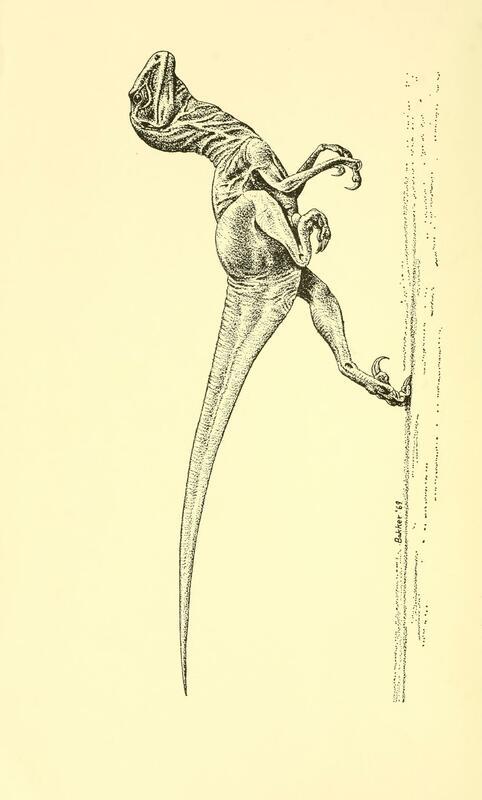 Morever, recent discoveries have pushed maniraptors far earlier than birds. Last year Haplocheirus, a very primitive alvarezsaur discovered in a Jurassic formation in China, was dated to a time 15 million years before Archaeopteryx. By constrast, the temporal problem of those advancing the hypothesis that birds arose from an archosaur similar to Euparkeria, have to account for the fact that there are nearly 100 million years during which no “links” have been found. Thus, for a theory based on fossil and phylogenetic evidence, the dinosaur origin of birds seems about as conclusive as one could hope for. (Huxley came to the same conclusion with considerably less evidence.) But there is one last nagging question from embryology. And it’s a question raised by Feduccia and then colleague Ann Burke (who is now at Weslyan). In Ann C. Burke & Alan Feduccia, “Developmental Patterns and the Identification of Homologies in the Avian Hand,” 278 Science 666-68 (October 24, 1997) (full text) argue that in all tetrapods (animals with four feet and their descendants: amphibians, reptiles (including dinosaurs and birds) and mammals) the first digit to develop is IV. This is as much true, they say, of the chicken as any other tetrapod. Since the other two digits that develop in the bird hand lay to one side of the fist digit, the array must be II, III and IV. “Dorsal views of four stages in the development of the right manus in Alligator mississippiensis (top row), Gallus (middle row), and Chelydra serpentina (bottom row). The stages in column 1 represent the early appearance of the primary axis. Column 2 shows the early digital arch. … Columns 3 and 4 show subsequent development of the digits. Note the transient appearance of digit V in Gallus.” From Burke & Feduccia. Click to enlarge. “We suggest that the theropod lineage leading toward birds faced a conflict between two evolutionary constraints: a functional necessity to retain the inner three fingers—especially the thumb—and an opposing developmental constraint favoring loss of the last-formed and most anterior condensation. . . . The reason that they remained persuaded of the dinosaur origin of birds was that even with the hand characteristics taken away and every other argument assumed in favor of the followers of Feduccia, Gauthier’s phylogenetic analysis still placed birds firmly within Maniraptora. The physical similarities are just too great to presume convergent evolution (especially from as long ago as Feduccia’s proposed primitive archosaur). When a hand bud in tetrapod embryos begings to devolop fingers the first visible digit (FVD) develops along the primary limb axis and in five fingered tetrapods, such as a mouse, it becomes D IV. In a chicken embryo the FVD is also aligned with the primary limb axis and develops into the posterior most digit. The presumption is that it is D IV (as it is presumably “homologous” to D IV in mice) and the other two digits are II and III. In mice the development of digit specific characteristics of digits IV and V are governed by descendants of ssh-expressing zone of polarizing activity (ZPA) cells. In chickens, however, ZPA cells in the forelimbs can contribute to the development of any of the three digits but it doesn’t determine the character of any of them. Tamura and colleagues swapped the ZPAs of hindlimbs (which have four digits) and forelimbs at the stage that digit specifications begin. They found that forelimb ZPA implanted on hindlimbs produced the hindlimb digits (by duplicating digits), whereas the hindlimb ZPA implanted on forelimbs frequently produced hindlimbs. This showed that ZPA had different contribution to digit character in fore- and hindlimbs. Staining the ZPA of the the two limb demonstrated that by the time the FVD develops its progenitor is inside the ZPA in the hindlimb but outside the ZPA in the forelimb. 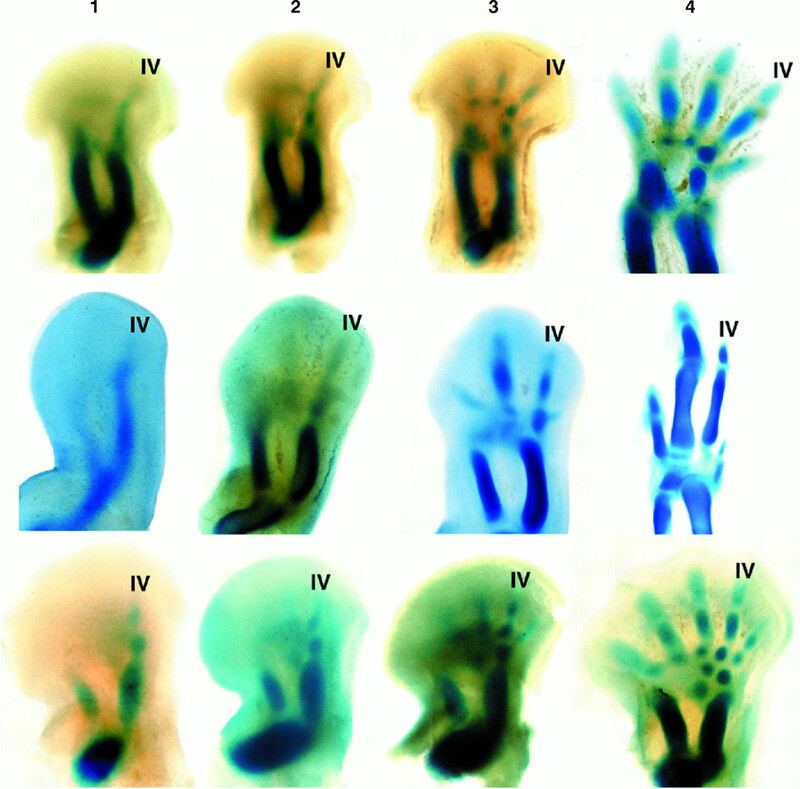 Furthermore, cell-labeling experiments provedd that the forelimb digit IV progenitor segregagtes itself from the shh-expressing ZPA but before digit specification. This segregation does not occur in the hindlimb (which develops a digit IV). This seems to be the final step in a remarkable series of discoveries that eliminated, one by one, each of the many objections to Huxley’s original theory of dinosaur origin of birds. It is also a testament of the power of phylogenetic analysis over other methods of presuming evolutionary relationship. One of the problems, of course, with the nay-saying mentality (which we see in creationists, global-warming deniers, and others) is the inability ever to concede gracefully. And so Feduccia is quoted in the non-peer-reviewed Science NOW section as saying: “Something very complicated is happening, but renaming digit identity based on these findings would be extremely premature.” Will there be more rearguard actions? That seems to be inevitable given the nature of modern discourse in all fields and the publicity that results from having a contrary opinion. And having gone so far out on a limb, Feduccia probably has no ability to glide to safety. *Hypsilophodon was first correctly described by Huxley in 1868 (before then specimens were incorrectly considered to be Iguanodons). It turns out, however, that Hypsilophodon was not closely related to Comsognathus or to birds. It belonged to the branch of dinosaurs (Ornithischia) that did not include the theropods or sauropods. Composognathus, on the other hand, was a theropod. Its similarity to Archaeopteryx was so close that one Archaeopteryx fossil that lacked feather impressions was at first misidentified as a Comsognathus. † The relationship between modern birds and extinct theropods is somewhat complicated. Although T. rex had the reversed hallux, an Archaeopteryx dicovered in 2005, known as the Thermopolis Archaeopteryx (because it now resides at the Wyoming Dinosaur Center in Thermopolis, Wyoming), has the best preserved feet of all specimens. 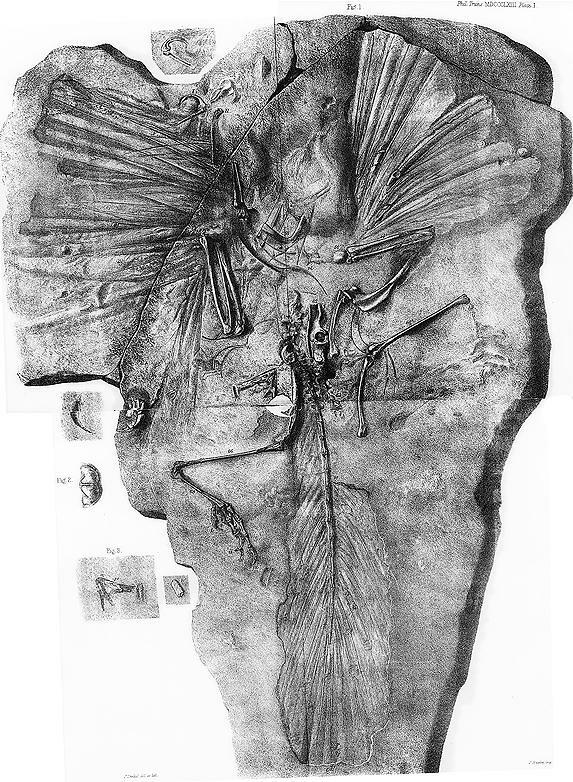 The authors who described it stated “the first toe of Archaeopteryx was spread medially and not permanently reversed as in extant birds.” See Gerald Mayr, Burkhard Pohl, D. Stefan Peters, “A Well-Preserved Archaeopteryx Specimen with Theropod Features,” 310 Science 1483 (2005) (pdf file). This apparently means that the reversed hallux was an instance of convergent evolution by modern birds and T. rex (and other later theropods). Since Deinonychus (and relatives) also lacked the reversed hallux, it does show a further anatomical similiarity between these theropods and Archaeopteryx. ‡ See Gary W. Kaiser The Inner Bird: Anatomy and Evolution (Vancouver: UBC Press: c2007), p 21. This results in the need to squeeze the brain to the back of the skull and restricts the connection between the olfactory organ and the brain to a small space. Kaiser’s book is an excellent tour through the architecture of the bird’s skeleton. It shows how and why birds are designed the way they are. It also shows how they are similar to and different from nonavian dinosaurs. ** The modern system of classification is phylogenetic systematics. It is a convention of this method to treat all descendants of any member of a group as a member of the group. Thus, if birds are descended from dinosaurs, then they are included as dinosaurs. Similarly birds are technically theropods and maniraptors. Since this post is about the evidence for the conclusion that birds descended from maniraptors I treat birds and extinct dinosaurs separately for ease of discussion. Who needs a frame-shift – why has the simplest explanation been ignored until now. just wondered where you managed to find the 3d image of the pigeon feet? I have been looking for one of these everywhere. That is my favourite quote of the day.